When I build in life-size scale, usually I build for realistic detail. 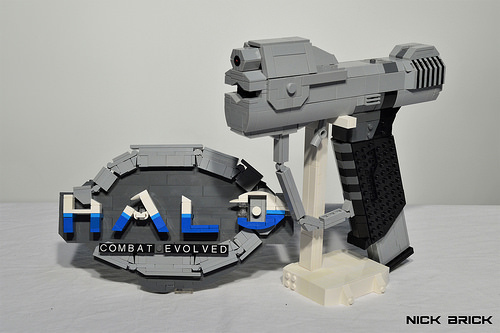 On the LEGO Halo magnum, I decided instead to focus on the in-game look and intentionally built it “low-poly.” I used simple geometry with few curves, flat textures, and any other method I could to make the build look like the magnum did on an original Xbox in 2001. 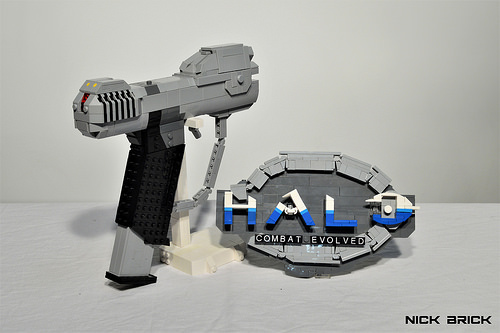 To complete its presentation, I built the original Halo logo to display alongside the magnum. See the moving trigger, removable magazine, and working slide in action in the video below. I also show a few techniques used to achieve the forms I wanted.